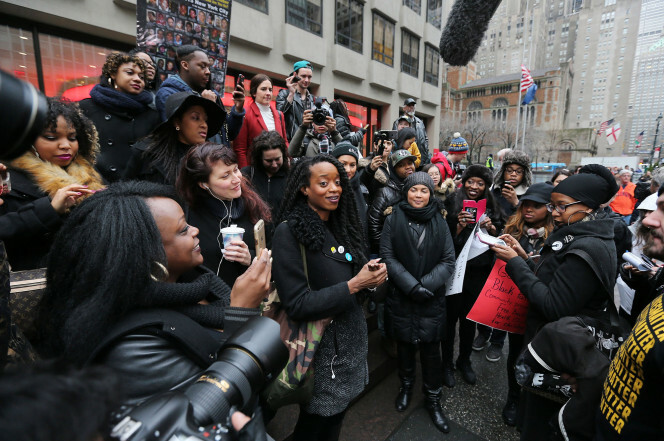 Remember the Anti-Beyonce rally which was set to hold at the NFL headquarters yesterday? Well, it took place but only 5 protesters showed up.According to the NY Post,the group Proud of the Blues invited anyone offended by her “race-baiting” Superbowl halftime performance to protest in front of NFL headquarters at 8 a.m. Instead, it erupted into a concert-style scene full of fans cheering for Beyonce. Dozens of Beyonce boosters waved signs in support of her halftime show and the Black Lives Matter campaign. Roughly five anti-Beyonce protesters arrived in total, including Ariel Kohane — whose sign was destroyed in the rain because he forgot to laminated it. “Beyonce is racist and is fueling hate. She is promoting violence against police,” he said of the singer’s nod to the Black Lives Matter movement during the performance. Last week, critics were outraged by the star’s Superbowl show, saying her costume evoked the Black Panthers.